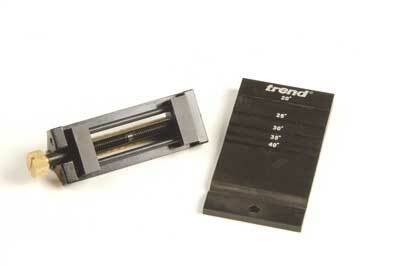 Trend have entered the sharpening jig arena with a roller-guided jig. It is similar to the Eclipse model that we all remember and which probably wore a groove down the middle of any stone we used it on. Trend have improved vastly on that guide by making the roller wider. If you spread the load it doesn't wear so fast; it's a simple but appropriate concept. There is a slight amount of play in the roller bearings so that needs to be taken account of when using the jig. Make sure the downward pressure is central and look at the ground edge regularly. The body is alloy and will accommodate chisels from 1/4in to 2in wide. Clamping is by means of side bars. With any guide of this type the angle is set by the amount of projection. Trend have made measuring the projection easy because they have included a plate marked with locating recesses and the angles which each projection will give. 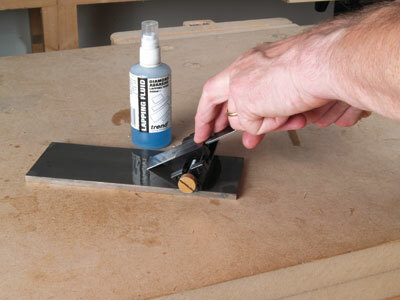 The roller sits in its own recess and it is easy to offer up the blade and clamp with the correct projection. It is also easy to choose intermediate angles as well. A simple scratched mark would give you, for example, 23 degrees. This guide has few moving parts and therefore has less to go wrong. Clamping is easy and positive. However it is less versatile than the Veritas guide, but the Veritas can have registration to central axis problems. If you don't possess a guide this is a good one to start with, but there is, for example, no ability to sharpen skew blades or to crown a blade. 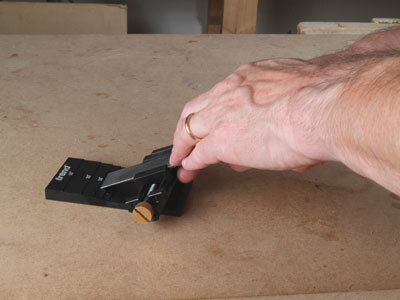 For those who already have Veritas guides, the only advantage of this one is the positive sideways clamping. You could get that by using the large Richard Kell guide, which has a more engineering approach, but it is more fiddly to use. "Clamping is easy and positive"